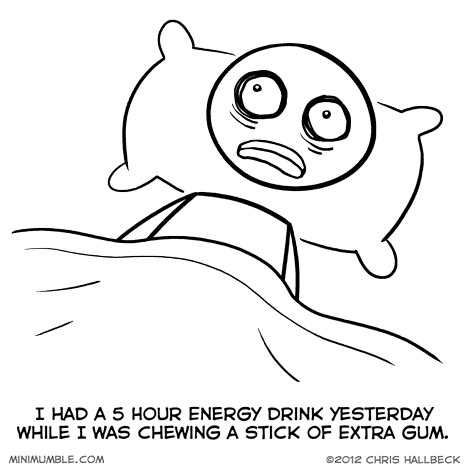 Caffeine can be very unpredictable with me. Sometimes nothing happens. Sometimes I get a little boost into a good mood. Sometimes I get an extra long buzz that keeps me focussed for a solid 8 hours. This becomes a nightmare when the buzz starts at 8PM and I spend 4 hours in bed staring into the dark contemplating why the Transformers change from a shiny perfect car into a dirty dented robot. Usually the first thing I notice about any caffeine-boosted product is the aftertaste. Always a slight bitterness, like someone slipped me a doctor-approved medicinal mickey. Getting it from the beans feels more honest, especially since it’s less concentrated than the raw extracted caffeine powder they add to “energy drinks”. I like to think of it as a pleasant side-effect of an occasional drink rather than a required daily stimulant. Caffeine really doesn’t seem to have much effect on me. Or maybe my addiction has been going on so long I’ve just built up a massive tolerance. It’s odd for me, too. Sometimes caffeine helps me wake up, sometimes it seems to do nothing, sometimes it gives me jitters, and sometimes (when I’m tired, but not always) it makes me more tired. I can help with your wondering. Holographic projector. A dirty, dented car where the dents don’t even match up is conspicious. A shiny, clean car is not. Hope the caffine wears off soon!